Jeff Wright (Forres) beat Bruce Thomson (Inverness) at the third hole of a sudden-death play-off to win the North Scottish Alliance championship and with it the Sir Hugh Mackenzie Trophy at Inverness Golf Club today (Saturday). They both scored one-under-par 68s. So Wright, who won the first two North Scottish Alliance fixtures of the 2016-17 season, also headed a field of 79 players to win the 14th and most important one, the championship. Scroll down to view another Robin Wilson picture of Jeff with the Sir Hugh Mackenzie Trophy. 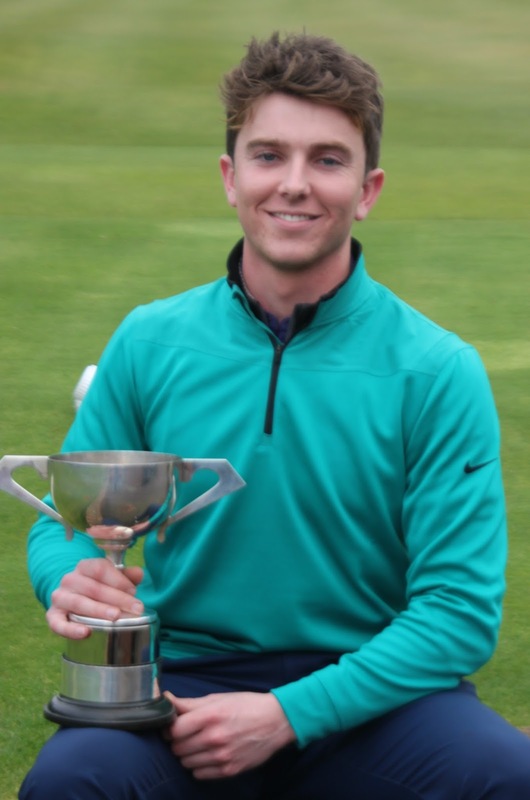 Jonathon Keith, the Inverness club champion, also scored a 68 but decided to go to Caley Thistle v Ross County football match rather than stay to make it a three-way title play-off. There was some consolation for scratch player Thomson in that his 68 won him the Class 1 handicap section and with it the Bank of Scotland Quaich. 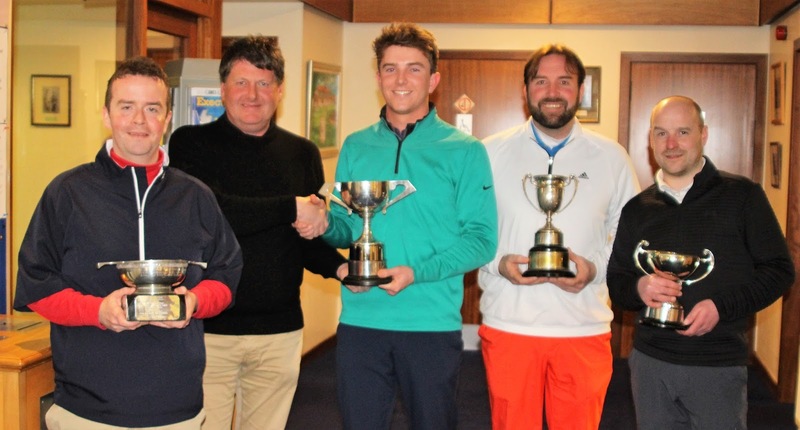 Bryan Fotheringham (Forres) won the scratch aggregate trophy and Ali Mackintosh (Inverness) won the handicap aggregate trophy. Marc Windsor (Nairn), won the Jim Thom Quaich for the best net score - a 69 off 12 - in Class 2. The Senior scratch title (J A B Little Trophy) was won by Gordon H Hay (Boat of Garten) with a score of 71. Colin Small, who plays off 11 at Nairn, won the J M C Gourlay Salver as the senior handicap champion. 68 J Wright (Forres), J Keith (Inverness), B J Thomson (Inverness) (Wright beat Thomson at third play-off hole). 69 A Cameron (Fortrose and Rosemarkie), B Fotheringham (Forres). 71 G H Hay (Boat of Garten). 74 A W Mair (Moray), D Hector (Elgin), J Carpenter (Forres), G Allan (Nairn Dunbar). 75 M McAllan (Elgin) p, J A Grant (Grantown on Spey), D Joel (Inverness), A Philip (Inverness), D Pitchforth (Nairn Dunbar), D McGrouther (Inverness), K Thomson (Moray). 76 R Harrower (Boat of Garten) p, A Henry (Inverness). 77 R Stewart (Nairn Dunbar), R Black (Inverness) p, R McKerron (Forres), J Shaw (Boat of Garten), A Macintosh (Inverness). 78 B Main (Hopeman), S Wilson (Inverness), S Mullen (Elgin), D Gordon (Inverness), R H Stewart (Torvean). 79 N McWilliam (Elgin), A Casey (Moray), I Murray (Boat of Garten), D Grindell (Inverness) p.
80 J Glass (Torvean), A Hutchison (Inverness). 81 S Mitchell (Moray), J S D Campbell (Grantown on Spey), D Johnston (Moray), M Windsor (Nairn), W Hutchison (Inverness). 68 B J Thomson (Inverness) (scr). 69 G Allan (Nairn Dunbar) (5), D McGrouther (Inverness) (6). 70 A Philip (Inverness) (5). 71 A Henry (Inverness) (5), A W Mair (Moray) (3). 69 M Windsor (Nairn) (12) . 71 C Small (Nairn)(11), S Laing (Grantown on Spey) (14). 72 A McWilliam (Moray) (16), W B Johnston (Moray) (10), S Taylor (Boat of Garten) (13).